With Siri on the new iPhone 4S having some problems recognizing speakers with heavy accents, it's important to note that users are able to tap Siri's transcriptions of their voice input and edit them to correct errors or change parameters. The tip is gaining some publicity from App Advice, who picked up on it from @mattgemmell. For example, let’s say you want to know where the nearest Italian restaurant is located, but then change your mind. Instead, you’re hungry for American food. To do so, you would say (or text): Siri, where is the nearest Italian restaurant. Once Siri gives you an answer, you can adjust the question as follows: Siri, where is the nearest American restaurant. While in some cases it may be easier to simply speak a new question or request rather than edit a previous one, the feature should be useful for those situations in which Siri is only slightly off in its transcribed text or when only a very minor change in the original request is required to obtain follow-up information. You don't have to say "Siri" in front of a question or request. Just talk normally. In fact, after you ask about the Italian restaurant, you can just say "Well what about American?" or "How about French?" or any other normal way you would do it. Siri is smart enough to understand you are still talking about restaurants and you don't have to phrase anything a certain way or give certain commands. There are no preprogrammed requests. It understands natural language. And no WP7 or any other phone is doing what Siri does. WP7. Everything you say is also shown in a text box which you can then use to adjust if necessary. You can do that with the old voice command, too. Use it every day. I'm more worried about the loss of the phone and sensitive data if it is lost, not whether or not someone can make a phone call. Siri, what is the pass code? Yes but on WP7 you're using voice commands. Siri is completely different than just simple voice commands. Siri is a virtual assistant that does so much more. You can ask it questions that a WP7 or Android's voice commands wouldn't be able to answer, because it's not just a command. This article is showing that since Siri can be used with physical input as well, there is a new way of interacting with your "assistant." However, if it is NOT understood as a command, the text is sent to Bing. And Bing does a pretty good job of answering these types of questions. Just go to Bing (or Google for that matter) and type your Sri questions to see what the reply is. How many onces in a pound? What is the square root of 345? The search engines can answer all these already. Before anyone freaks out, I am not saying it can record notes and update your calendar. I am saying it will send your text to Bing and provide the Bing results. No more. No less. Since this is made by Wolfram could Siri also do things the website can do like finding the derivative of a function? This would be a killer feature if i didn't need wifi or 3g. As I land up doing my homework on a plane most of the time. 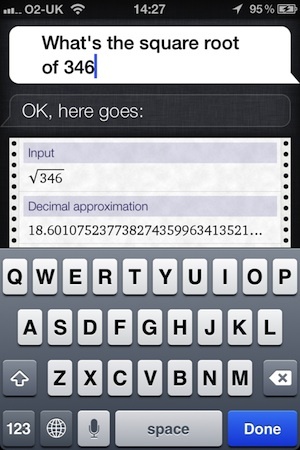 Actually Wolfram Alpha is just one of the sources that Siri uses. The technology was originally created as part of a project at DARPA aimed t creating learning personal assistants for the military and then spun out by SRI International as the company named Siri. Shortly thereafter Apple bought Siri. They were pretty quick too. I think it was only a matter of weeks after Siri was spun out that Apple made their move. What I love about this is that we're seeing the emergence of a technological dream here. For decades we've imagined computers would can interact with like people, who can respond intelligently to tasks and questions. This here is a big step towards that dream. Think of what computer games were like two decades ago. Now think of what they're like now. If this technology moves as quickly as the computer games industry did then in twenty years time we'll be talking to computers in full flow, not even bothering to think about it. How anyone can see this and not be excited by it is beyond me. A paradigm shift is underway and we're here to see it begin. maybe i'm misunderstanding, but the example in the article sounds like asking it a whole new question... i don't get it. Wut a hype for this toy, tons of nerds talk to cellphones oh pardon, iPhones saying "call mom". Why are people this ignorant over Siri? I guess it was that way with the mouse too.